Mandala Shoes is located in Santanyi, a town in the South of Mallorca. The store has an exclusive character, merging classic Mallorquin architecture with its own contemporary style. Select decoration and thoughtful details in every corner of the shop result in a cozy space that stands out for its excellent service and unrivalled personal attention. A wide selection of accessories, belts, handbags and suitcases can be found in the store, all made using top quality leathers, and displaying the exquisite poise characterising their style. Appreciation of style and original design as well as quality hand-made craftsmanship are the cornerstones of this family workshop, which was founded by Jose Luis de la Mano. With over thirty years’ experience he set the path for the evolution of this innovative and professional company. 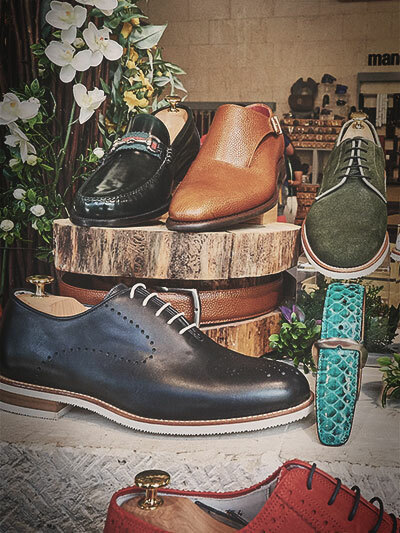 Mandala Shoes specialises in custom and tailor-made footwear. Made to measure, you can choose the model, colours, leather and other materials, giving you perfect fit and style.